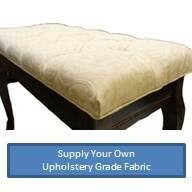 Custom Tufted Upholstered Benches - Made in USA is rated 4.50 out of 5 based on 1 ratings. Build a bench to suit your taste and to reflect the surroundings unique to your home. Our Custom Tufted Upholstered Bench provides a supple seating experience that will last for years and look elegant everyday. Each bench is made to order. Fine details and immaculate craftsmanship take time, so please plan on a two to three week wait for delivery. 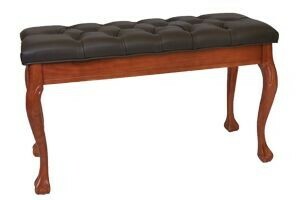 Each bench seat is 14" x 30"
Leg Style Choices - Most of our leg heights are 19" tall. If you need a 22" tall leg choose Square Tapered 22" in the leg choice drop down. Wood Finish Choices The standard finish colors are Ebony, High Gloss Ebony, Dark Walnut or Dark Mahogany, but to more closely match your particular piano or home we also offer Medium Mahogany, Steinway Mahogany, Brown Mahogany, Medium Walnut, Steinway Walnut, Dark Oak or Light Oak. Our Upholstery Fabric Choices: Pick from our 11 Fabric Colors or Vinyl or Leather. Customer Supplied Fabric: The ultimate choice! If you prefer, you may also choose to supply your Own Upholstery Weight Fabric (please call customer service for details). SPECIAL NOTE ON THIS CUSTOM ORDER BENCH - These benches are clearly one of a kind, you build them to your taste and to reflect the surroundings unique to your home. Due to this we cannot take any returns on these benches. Of course we will replace a bench that has defects in the workmanship. For more on our custom product policies please read here: https://www.perfectlygrand.com/returns. Perfectly Grand © 2004 - 2019. All Rights Reserved.